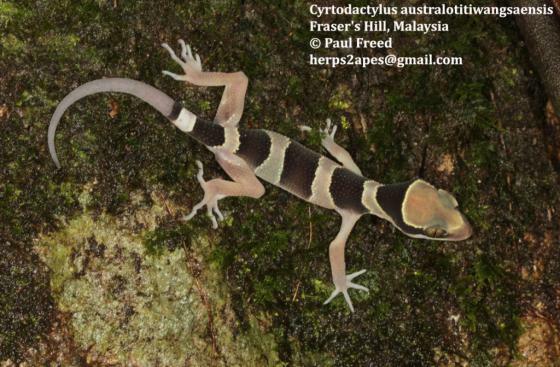 Can you confirm these amateur observations of Cyrtodactylus australotitiwangsaensis? Type locality: back road up to Fraser’s Hill, Pahang, Peninsular Malaysia (03° 43.1699 N, 101° 45.4789 E) at 1059 meters elevation. Types Holotype: ZRC 2.6979, adult male, collected on 27 August 2006 by L. Grismer. P. Wood, Jr., and T. Youmans. Paratypes. Paratypes ZRC 2.6980 and LSUHC 8088–90 (adult female and adult males, respectively) have the same collection data as the holotype. Paratype LSUHC 6637 (adult male) was collected on 18 August 2004 by P. Wood, Jr., and T. Youmans at Genting Highlands, Pahang, Peninsular Malaysia (03° 25.2388 N, 101° 47.3300 E) at 1346 meters above sea level. Diagnosis Diagnosis. Adult males reaching 120.1 mm SVL, adult females reaching 97.2 mm SVL; 9–12 supralabials, 9–13 infralabials; tubercles of dorsum small to moderately large with no intervening smaller tubercles; no tubercles on ventral surfaces of forelimbs, gular region, or in ventrolateral body fold; 37–45 paravertebral tubercles; 22–30 longitudinal rows of dorsal tubercles; 32–40 rows of ventral scales; 21–25 subdigital lamellae on fourth toe; 39–45 femoro-precloacal pores in males; dorsum not bearing a scattered pattern of white tubercles; three or four body bands in adults lacking lightened centers and light colored tubercles; band to interspace ratio 1.00–2.00; seven or eight dark, caudal bands on original tail; white caudal bands in adults immaculate; and posterior portion of tail in hatchlings and juveniles banded not white. These characters are scored across all species of the Cyrtodactylus pulchellus complex in Table 6 [GRISMER et al. 2012]. 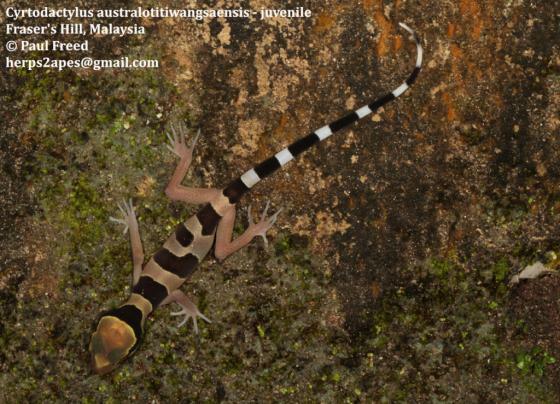 Etymology The specific epithet adjective australotitiwangsaensis is derived from the combination of the Latin australis meaning southern and the name of the mountain range, Titiwangsa, in which this species is endemic and refers to its occurrence in the southern portion of this range.